Thanks to one of our Fabulous Finders, David has a blanket, but he’d like to find a backup, too. We lost our twins’ blue baby blankets at the local Petsmart last week. 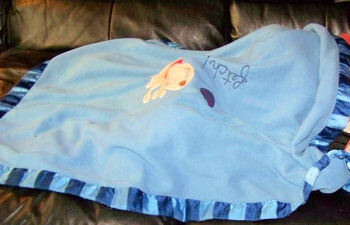 They are blue blankets with an alternating dark blue/light blue silk border. The blankets themselves had a picture of a dog with a ball and the word “fetch” on them. They were made by Koala Baby and were purchased in late 2006 or early 2007. They were left in the cart in the parking lot cart return, and they were gone when we went back 20 minutes later. No one turned them in. We (and they) would be forever grateful if two could be located. 40% off their asking price. Sorry appears to be only one available. ebay #290960651957 is the second blanket. Best Wishes!